Three years before Brian Sipe began his magic with the Cleveland Browns, Bill Fitch and his band of Cavaliers brought a buzz to Northeast Ohio basketball that fans had never seen before. Despite a rough start to their 1975–76 season, the Cavaliers rode the shoulders of Akron native Nate Thurmond to the Central Division title. Under his leadership, they qualified for the playoffs. Then in April the Cavs provided fans with a remarkable string of games against the Washington Bullets, winning in incredible fashion three times—twice at The Coliseum in Richfield—en route to a 4–3 series victory in the Eastern Conference Semifinal. No major league team has been blessed with more great, Hall of Fame–worthy players than the New York–San Francisco Giants, nor does any other team enjoy the support of more loyal and knowledgeable fans. 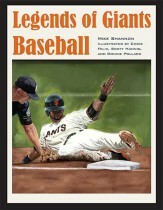 With Legends of Giants Baseball, fans can savor a stunning tribute to their heroes.